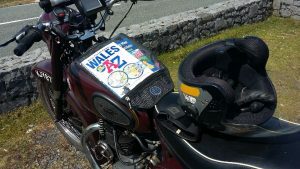 The Brooklands Section annual holiday this year was a repeat of last year’s format, a mid-week four day trip to Wales, with accommodation at the Baskerville Hall hotel near Hay on Wye. Supported by a hired back up van we set off from Farnham very enthusiastic as the weather forecast was predicting a dry spell for the whole trip. Our route has developed over previous trips and this year was presented to us in ‘tulip’ and turn-by-turn form ( thanks to Phil Winks ). After some lengthy roadworks and an HGV breakdown we arrived at our first stop at the wonderful Saddleback Farm Shop and Café near Wantage. Once the van caught up with us we proceeded to the lunch stop near Tewksbury and enjoyed lunch and a drink outside. Then onward and we just managed to beat the school run traffic in Hereford and onto our accommodation. Dinner and then yes a few pints, with the beer nearer £3 a pint than over £4 we are used to paying, some advantage of this was taken. On the Tuesday, another dry day was in prospect. 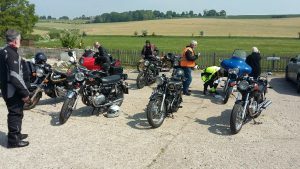 Our planned ride out was led by our treasurer David Bell; in fact this was David’s first as Run Leader. The run took us into the Black Mountains, a mixture of A and B roads including moorland with the inevitable sheep hazards. Glorious views over moors and excellent road surfaces were enjoyed, with a mid-afternoon return back to the hotel for some leisure time. Well done David, your first of many runs I hope. 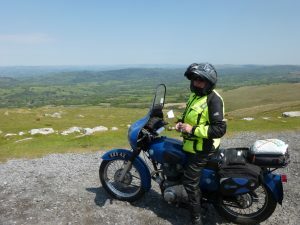 The second day ride out was led by yours truly, a ride to Tintern Abbey, returning via the wonderful A466 to Monmouth and then the Golden Valley back to Hay. In an attempt to avoid the only section of dual carriageway on the route I lost the group at a complex double roundabout. Fortunately we re-grouped and onward, happening on a very popular biker venue, the Steel Horse café near Usk. At this point we realised that I had left one of the group at the hotel, but fortunately we were able to contact him. 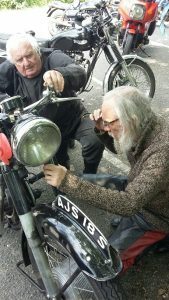 It turned out he was not far away so we enjoyed the company of other bikers at the café and then when we are all together rode onto Tintern Abbey. After lunch in the sunshine we began our ride back. The A466 to Monmouth did not disappoint and then the glorious B roads through to the Golden Valley. The only challenges being the terrible state of the road surface (even worse than Surrey) and the agricultural vehicles which were very busy. On our return to the hotel some walked into Hay on Wye which was gearing up for the book festival, yes more beer, any wonder I put on two pounds during the trip! For our return home the weather turned a little damp and we made our way back without event. Overall another very enjoyable trip, no breakdowns (save some running repairs) no spills or major illness. I would like to thank all involved in organising and the preparations, and for everyone’s enthusiastic participation. This was our third visit to the Baskerville Hall hotel and although it’s very good and I feel there is more still to do from this base, it’s probably time to look for a new destination for next year. The committee would welcome any suggestions and ideas.